In version (1.2.1) and older, player that wanted to play with host who used a custom map had to downald this map. But after (1.5.0?) update there is no need to downald custom map if you want to play with host who use this map. So... Da greatest creators of da SFD worl made some kind of... Transfer ._. ? That allows them to play on custom maps without specific map in folder. Map maker armed with this tool will be able to make clothes for NPC and players (if force em with scrpits). And this thing will need a paint like window that allows map maker to make all clothes frame by frame. Custom weapons editor is probably... To hard to make? No and no. We will not transfer custom painted textures due to the amount of increased data to transfer (what would stop you from creating 100+ textures? ), the coding it takes and the overall handling. The engine wasn't designed for this at all and is nothing Hjarpe and I need for SFD. Sorry, won't happen. I have to agree with Gurt. Despite new (official) textures in the editor are always desired, custom-made ones would surely break out from the general sfd convention. The game would change its esthetic character too far. Yeah. I thought that it could be cool to create custom textures. Never crossed my mind this way. Thanks! 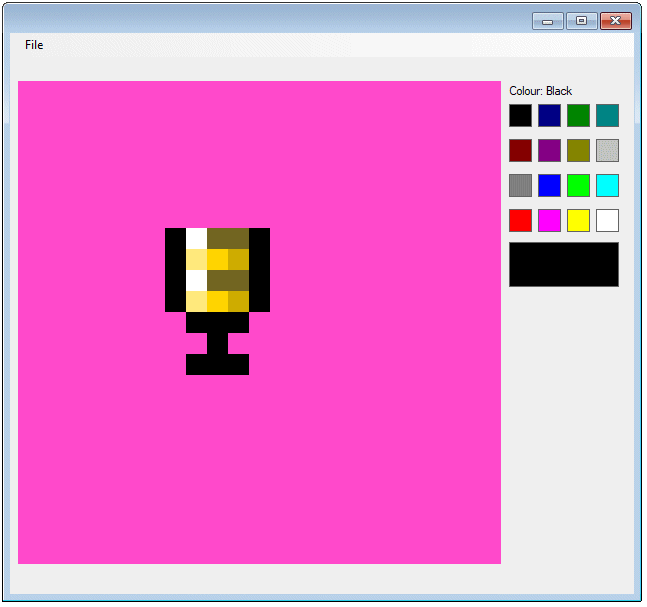 And by the way, with the small bgWall components you can make your own pixel art! Last edited by Motto73 on Mon May 23, 2016 10:08 am, edited 1 time in total. I'm sure that if we had the tools, custom texture packs could be made, and with those, we could have some crazy campaigns in the future. Again, we just need the tools. I don't think we can get our hands on them, however. I'm not saying that we need this now, but it would certainly be helpful if there were to be a feature in which we could incorperate a custom asset/spriting feature, so that both the devs and users can create custom images in FBG/BG/FG so that a large amount of tiles can be removed, as well as being able to make tiles as needed. I'm hoping the way I'm suggesting it can be detailed into coding so that if the devs consider this, they can at least be able to better transpose the idea to best fit what I'm trying to suggest. There would be a simple 8x8 tile in which users can drag and drop onto the editor scene. This 8x8 panel can be expanded to be able to fit dimensions as needed within the map editor itself. Users have two important properties to access with these tiles. The first one, being Grayscale Enabled, a boolean value which allows the tile to be subject to the coloring. 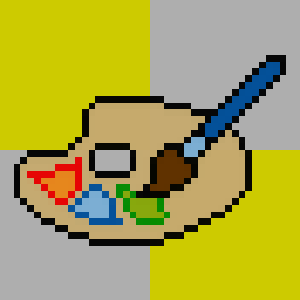 The second, Edit, which will open a standalone MS-Paint Type program with a canvas with the same dimensions as the placed tile. If grayscale is set to true, program will limit the user to only drawing using the grayscale pallete (or essentially setting R, G and B to 0 and locking them from being moved). Users can then draw whatever their heart desires (Hopefully in an art style akin to that of SFD). - Standard Spriting tools found on MS Paint (Y'know the ones that really matter like lines, boxes and other such). - Set a Transparency Color (This can either be a single, spesific color, or just have the standalone automatically process a transparent background). - Copy/Paste (Because users will want to copy the fantastic art of others as usual). - Export as .PNG (Or whichever HQ image file is easier for XNA GS to convert to, helpful for having a backup image). Custom Assets are not only a way to cut down on the amount of space the game requires to load tiles, but it can also be easier for users to add additional detail to already current tiles. No more need for signs (and all respective tiles affiliated with them), billboards, and most of the far background tiles! Giving users more freedom to work with will encourage users to make more unique maps. I'm sure you'll find that the effort put into adding this feature now, will have a much greater payoff in the end, decreasing the stress of loading map tiles as well as freeing space for additional features to be added into the game. Would it be a possibility that, if somehow Sfd ever reach steam, to incorporate some functionnalities of the workshop? First off let me start by saying, i didn't really know where to start this topic, the other forum indexes weren't specific enough. And you will never be able to create your own custom profile body parts. Today I was creating some textures,and then "oh,why can't we edit the clothes?" if we can edit the weapons,we can edit the clothes,but actually,NOT. That's quite sad...Because if we want a "dark goalie mask",we can't have it. So,in next update I will hope this possibility. It'll edit only how you see everyone's appearance in your screen, like a texture. I don't approve this as a possibility, but I think more items will come soon. You can suggest a dark goalie mask if you want. If it's like a texture why not make it a texture, we can freely edit the textures of weapons so why is it a dilemma to do the same for clothes? If I want to make custom masks/clothes I'll look past the fact it may make other people's outfits look a bit wacky. Yes, it would be a hastle but many people do this there are definetly some great spriters here that could do it i mean in higher quality games like a game called cosmoteer, if you want to mod in weapons then you'd need to make full animations and clothes editing here would be simpler than that since you would have something to work on allready, though the possibility isn't great it still would be possible. First of all I want to thank @Shock and @Vitamin E for the precious help in making this thread as content-polished as possible. Managed color palette, maybe with a little bit more of variety than the standard one we find on normal tiles. Any constructive feedback is, as always, appreciated. Feel free to discuss any addition or change you think this concept will benefit. So since this topic is like a yearly reoccurrence I have merged all the existing threads that propose creating custom clothing/object editors all in one place for the convenience of everyone involved in the discussion. The devs were generally against the idea - as can be seen in a couple of merged replies (and the fact that one of these threads I merged was locked by Gurt himself) but let's give this idea one more chance and if @Gurt says no then this big thread can be locked once and for all. See Mod notes on merged threads (posts written between merged threads belong to these specific [once-standalone] threads and were not submitted as general discussion regarding the subject).